Povidone iodine is a stable chemical complex, which is a blend of polyvinylpyrrolidone (povidone, PVP) and elemental iodine. It is also known as iodopovidone and PVP-I. Povidone iodine is a wide spectrum microbicide that eliminates microbial protein and DNA. Additionally, it possesses excellent performance properties such as improved antimicrobial action on a wide range of microorganisms. Povidone iodine is used as an antiseptic medicine, which is extensively employed in topical applications to cure and treat skin infections and minor wounds. According to the U.S. Pharmacopeia, povidone iodine is a complex of iodine with povidone. It contains not less than 9.0% and not more than 12.0% of available iodine (I), calculated on the dried basis. In 1955, povidone iodine was discovered in Industrial Toxicology Laboratories in Philadelphia by H. A. Shelanski and M. V. Shelanski. Tests were carried out to validate the antibacterial activity of the complex. The chemical was found to be less toxic than a tincture of iodine. Povidone iodine is employed in a wide range of applications such as skin sterilization, infection prevention, instrument sterilization, and others (including breeding and aquaculture). Skin sterilization is a major segment of the global povidone iodine market. Povidone iodine is used extensively in skin sterilization products such as povidone iodine surgical scrubs, povidone iodine solution, swab sticks used for preparation of the skin prior to surgery, and post-operative skin cleansing. It is also used in the treatment of infections in wounds; cuts; burns; ulcers such as decubitus ulcers and stasis ulcers; and diabetic wounds. In terms of volume and value, the skin sterilization segment held major share of more than 45% of the global market in 2017. Skin sterilization is a rapidly expanding segment of the market. It is driven by the rise in demand for povidone iodine in applications such as disinfectants and antiseptics. Furthermore, increase in geriatric population is projected to augment the demand for antiseptics and disinfectants. Povidone iodine is used in a broad range of applications in veterinary medicines, primarily as antiseptic for large and small animals. Rise in inclination toward protein-rich diet is anticipated to propel the animal health care industry. Growth in disposable income allows consumers to spend on a variety of meats. This, in turn, is augmenting the demand for antiseptics. Rise in adoption of pet animals, especially in emerging economies, owing to improvement in lifestyle and economic development is boosting the demand for animal health care products such as veterinary shampoos and antiseptics. This, in turn, is likely to augment the demand for povidone iodine due to its excellent microbial efficacy and mild sensation. However, povidone iodine based antiseptics are not preferred in preoperative cleansing and long action applications such as catheter insertion, skin preparation for surgery, and hand wash before surgery owing to their short time period of antimicrobial action compared to the alternatives. Chlorhexidine-alcohol and sodium hypochlorite are close substitutes of povidone iodine that are preferred in the applications mentioned above. Hence, the availability of strong substitutes is estimated to hamper the global povidone iodine market in the near future. In terms of volume, North America held leading share of more than 35% of the global povidone iodine market in 2017. Implementation of stringent regulations on surgical hand antiseptics, as recommended by the Food and Drug Administration (FDA), Centers for Disease Control and prevention (CDC), and other regulatory authorities, is likely to propel the demand for povidone iodine in North America. Hospital-acquired infection (HAI) is a key reason for number of deaths in the U.S. Povidone iodine based antiseptics and disinfectants can lower the risk of HAIs. Furthermore, increase in number of trauma, dental, and maxillofacial and bariatric surgeries in the U.S. has positively impacted the demand for antiseptics and disinfectants. Thus, rise in awareness about hygiene and need for disinfectants is driving the demand for povidone iodine in North America. The market in Europe and Asia Pacific is expected to expand at a rapid pace, while that in Latin America and Middle East & Africa is anticipated to expand at a sluggish pace between 2018 and 2026. The global povidone iodine market is fragmented with the presence of regional and local players. Most of the key players are established in Asia Pacific, specifically in China and India. They exports their products to North America and Europe. Prominent players operating in the market are Glide Chem Private Limited, Adani Pharmachem Private Limited., Boai NKY Pharmaceuticals Ltd, Lasa Supergenerics Limited, Medline Industries, Inc, R.N. LABORATORIES PVT. LTD., BASF SE, Samrat Pharmachem Limited, SHANGHAI YUKING WATER SOLUBLE MATERIAL TECH CO.,LTD., Avrio Health L.P., Huangshan Bonsun Pharmaceuticals Co.,Ltd., NIPPON SHOKUBAI CO., LTD, Vishal Laboratories, Zhangzhou Huafu Chemical Co., Ltd., and JH Nanhang Life Sciences Co.,Ltd. Market players have been profiled in terms of attributes such as company overview, financial overview, business strategies, and recent developments. Povidone iodine (iodopovidone and PVP-I) is synthesized by the blend of polyvinylpyrrolidone (povidone, PVP) and elemental iodine to form a stable complex. According to the U.S. Pharmacopeia, povidone iodine is a complex of iodine with povidone. It contains not less than 9.0% and not more than 12.0% of available iodine (I), calculated on the dried basis. It is widely used in infection prevention and instrument sterilization materials owing to its excellent antimicrobial action on a wide array of microorganisms. Based on application, the skin sterilization segment held major share of the global povidone iodine market in 2017. Povidone iodine is employed broadly in skin sterilization products that are used for preparation of the skin prior to surgery, and post-operative skin cleansing. Povidone iodine-based products are povidone iodine surgical scrubs, povidone iodine solution, and swab sticks used for preparation of the skin prior to surgery and post-operative skin cleansing. Demand for povidone iodine-based skin sterilization products is increasing owing to its excellent performance properties and rise in demand for pre- and post-surgery sterilization products across the globe. This trend is likely to continue throughout the forecast period. Infection prevention is also a key application segment of the global povidone iodine market. In terms of value and volume, North America accounted for prominent share of the global povidone iodine market in 2017. The region is expected to continue its dominance during the forecast period. North America is experiencing an increase in number of trauma, dental, and maxillofacial and bariatric surgeries in the U.S. This has positively impacted the demand for antiseptics and disinfectants. Furthermore, regulatory bodies such as the Food and Drug Administration (FDA) and Centers for Disease Control and prevention (CDC) have implemented stringent regulations on surgical hand antiseptics. The U.S. has experienced an increase in hospital-acquired infections (HAIs). This has boosted the demand for antiseptics and disinfectants. Povidone iodine is preferred in surgical hand antiseptics and infection prevention products owing to its excellent efficacy against microorganisms. This is estimated to augment the demand for povidone iodine in North America. The market in Asia Pacific is anticipated to expand rapidly during the forecast period, led by the growth in the health care sector due to public and private funding and increase in awareness about health care products, primarily in emerging economies of China and India. However, povidone iodine-based antiseptics and disinfectants have shorter period of action compared to their close substitutes such as chlorhexidine alcohol and sodium hypochlorite. These substitutes are preferred in long action applications such as catheter insertion, skin preparation for surgery, and hand wash before surgery. This is projected to restrain the market in the near future. This report analyzes and forecasts the market for povidone iodine at the global, regional, and country levels. The market has been forecast in terms of value (US$ thousand) and volume (tons) from 2018 to 2026, considering 2017 as the base year. The study includes market indicators, drivers, and restraints of the global povidone iodine market. It also covers the anticipated impact of these drivers and restraints on demand for povidone iodine during the forecast period. The report also highlights opportunities in the povidone iodine market at the global and regional levels. The report also analyzes price trends and forecasts prices of povidone iodine, by application, at the global and regional levels. The report includes detailed value chain analysis, which provides a comprehensive view of the global povidone iodine market. Porter’s Five Forces model for the povidone iodine market has also been included to help understand the competition landscape of the market. The study encompasses market attractiveness analysis, wherein application segments have been benchmarked based on their market value, growth rate, and general attractiveness. The study provides a decisive view of the global povidone iodine market by segmenting it in terms of application. In terms of application, the povidone iodine market has been segregated into skin sterilization, infection prevention, instrument sterilization, and others (including breeding and aquaculture). Market segments have been analyzed based on the present and future trends. Regional segmentation includes the current and forecast demand for povidone iodine in North America, Europe, Asia Pacific, Latin America, and Middle East & Africa. The report provides the actual value of the povidone iodine market for 2017 and the estimated market value for 2018 along with forecast for the next eight years. The size of the global povidone iodine market has been provided in terms of volume (tons) and value (US$ thousand). The market value has been provided for the global, regional, and country-level markets. The report comprises profiles of major companies operating in the global povidone iodine market. The global povidone iodine market is fragmented among large number of global and local unorganized players. Key players include Glide Chem Private Limited, Adani Pharmachem Private Limited, Boai NKY Pharmaceuticals Ltd, Lasa Supergenerics Limited, Medline Industries, Inc, R.N. LABORATORIES PVT. LTD., BASF SE, Samrat Pharmachem Limited, SHANGHAI YUKING WATER SOLUBLE MATERIAL TECH CO.,LTD., Avrio Health L.P., Huangshan Bonsun Pharmaceuticals Co.,Ltd., NIPPON SHOKUBAI CO., LTD, Vishal Laboratories, Zhangzhou Huafu Chemical Co., Ltd., and JH Nanhang Life Sciences Co.,Ltd. Market players have been profiled in terms of attributes such as company overview, financial overview, business strategies, and recent developments. 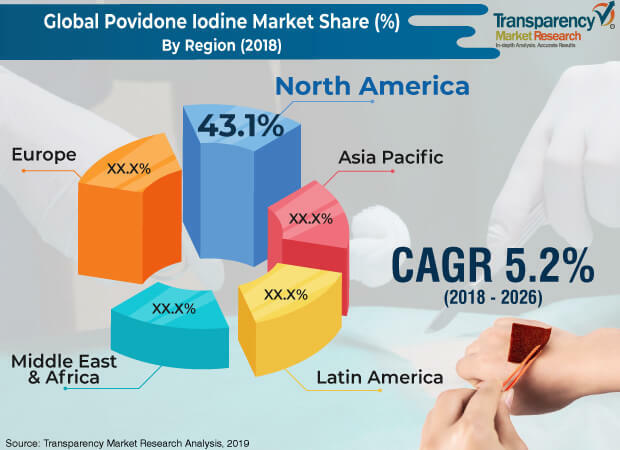 The report also comprises a matrix of comparison between the top two players operating in the global povidone iodine market along with analysis of business strategies.